Note: Legend reads left to right. The chart reads clockwise starting at the 12:00 position. We've truncated our pool of teams to the top 10 most voted for teams. Graphing all 30 teams is possible, but it's awfully messy. 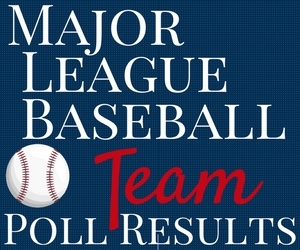 Out of the 2,520 votes collected, 58% went to the top 10 teams. The beloved New York Yankees edged out all other Major League Baseball teams as the #1 team our members are rooting for during the 2017 season. The Boston Red Sox and Chicago Cubs rounded out the top three with 226 and 201 votes, respectively. The Texas Rangers, who has headquarters in Arlington, Texas (smack dab between Dallas and Fort Worth and hometown of American Consumer Opinion®) came in fifth with 117 votes, trailing the fourth most popular Atlanta Braves' 155 votes. Check your "My Account" page at www.acop.com for current quick polls.